SUSAN CERULEAN: On November 13, Rhys Bowen mused on this blog about escaping to special places she loves, in these troubled times. Places that might be safer. Places untouched by violence and wildfire and climate change. Part of me wants to escape, too. But what happens when even your beloved place of solace is hurt or destroyed by fire, wind, storm or violence? Hurricane Michael, a Class 4 hurricane with wind speeds topping 150 miles per hour, buzz-sawed through North Florida four weeks ago. My special place, a coastal barrier island with wide beaches, enormous sand dunes and green pine forests, was slammed by the eastern bands of that storm. The island, a national wildlife refuge, didn’t receive the attention of nearby, hard-hit communities of Panama City, Mexico Beach and Port Saint Joe, because no people live there. But a week after the storm, my husband and I kayaked over to the island, and were shocked at the loss of miles of tall, 800-year-old sand dunes, the island's first line of defense. Nor could we account for the hundreds of brown pelicans, black skimmers, gulls and terns that had made their homes--the places where they nest and rest and raise their young--on the island. I knew I couldn’t bring back the birds or the dunes, or stop hurricanes or the sea level from rising, but I knew what I could do: pick up trash left behind by the storm. I cleared about a mile of the beach of plastic, enough it seemed, to fill a Walmart. Four enormous trash cans, watering cans and golf tees, fishing poles and buckets, chairs and children’s toys, and even the signs that had marked off the nesting bird areas. It was a cool beautiful day, and somehow, in all those hours of schlepping and hauling trash, I found some happiness. When the birds do come back, they won’t find their refuge choked with storm debris. And perhaps, I thought, the beaches, now doubled or tripled in width, would offer attractive nesting to sea turtle nesting next year. What do you turn to when the problems of the world feel overwhelming? 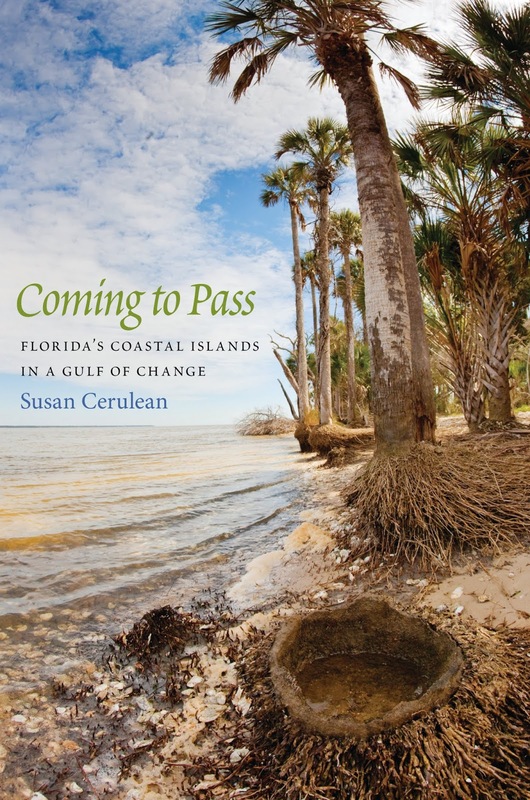 Writer and naturalist Susan Cerulean divides her time between Indian Pass and Tallahassee, Florida. Her most recent book, Coming to Pass, Florida's Coastal Islands in a Gulf of Change, won a gold medal from the Florida Book Awards in 2016. The book is now available as a paperback from the University of Georgia Press. There’s an alarming amount of plastic everywhere I look . . . it’s a truly troubling problem . . . .
We live in the Pine Barrens, which means that we live right in the middle of a lovely, calming place. Add the wonder of stars spread across the night sky and it gives you a bit of perspective to face the overwhelming stuff . . . .
What a truly wonderful thing to do! Not many would think about clearing an uninhabited island after a hurricane. I escape into books and music. It soothes my mind and I can go somewhere that makes sense to me. I think it often comes down to "caring for what we know, and have come to love," don't you Deb? We all have them, whether a grandchild or a bird Refuge. What a lovely thing to do, Susan. The amount of junk that accumulates after a storm is truly amazing and the damage it does to the wildlife can be unimaginable. I admit to giving a silent cheer on reading that Michael increased the beach width. It's good to know that something positive came out of the horror he left behind. Joan, Pine Barrens is a term I associate only with New Jersey - is there another state that uses the term or are you an NJ dweller? Yes, sometimes it takes a storm to reveal what we've been dumping out of sight. I know the beaches appreciate your cheers, Kait! LOVED this piece, Susan... Reading about natural (and man-made) disasters is excruciating. I want to scream BUT WHAT CAN I DO ABOUT IT! and coming back with the depressing answer, 'nothing.' You found a way. Aww thanks, Hallie! I know that feeling, and I know sometimes it feels like we can't do a thing. But I know you do your share! Thanks Mary! It's hard not to get overwhelmed, I like your friend's philosophy! We turn to books when the world feels overwhelming. The Native American tribes really understood how to take good care of the environment because they respected the Earth. We could take lessons from them about taking better care of the environment. For example, the Dust Bowl of the 1930s, causing many people from Oklahoma to leave, would never have happened if the Native American tribes were allowed to remain. Just my opinion. I saw a post on Facebook about how people in Switzerland are encouraged to recycle instead of throwing things in the trash. They have to pay for their trash to be picked up! Thanks, Susan! I try to recycle as much as possible. Susan, how lovely to have you here, and what a wonderful piece. You and my dad would have been kindred spirits. He loved to walk and wherever he went, he carried a plastic bag with him to pick up the trash other people had dropped. I admire your efforts to clean up the storm damage, and hope the birds return soon to your peaceful island. Thanks, Deborah! I hope so , too. Susan, I am so sorry your island took a direct hit from the hurricane but I am so glad you were there to tidy up afterwards. My husband is a big advocate for sea turtles and he and I are both hoping they choose to nest on your island. As for me, living in the desert, I am witnessing destruction of the manmade kind. SO much of our pristine desert is being plowed under to build ridonkulous mcmansions for people with more money than sense...ack, sorry...I get ranty. Anyway, when I am upset about my natural places being destroyed, I donate to causes - time and money - that support the environment and then I write texts, emails, and letters to my legislators. Someone has to speak for the trees, the mountains, the wildlife, and the seas. Speaking for the place you love is as important as absolutely anything we can do, I agree, Jenn. It's so good to know you are out there advocating for the desert. And yes, we do have sea turtles nesting on our island, loggerheads! Wow! Susan, you serve as a great example to all. You are the proverbial "put your money where your mouth is" light for others to follow. Of course, it would be "put your elbow grease where your mouth is" for you and your husband. You two are hope in a world too often gone mad these days. Thank you, Kathy, for your kind words. I find that librarians are some of the best conservationists I know. You're the perfect example. Many thanks to Susan and her loving work and Hank for those last lines from On Angels.